Aertv is changing. From January 2014 you will need to be a premium subscriber to access Aertv channels from a mobile device. 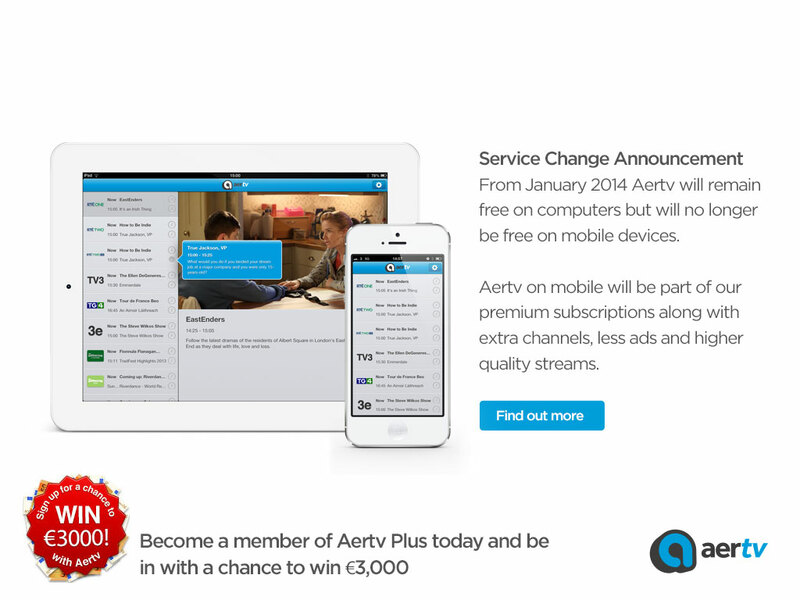 You can upgrade to Aertv Plus for €1.29 for the first month and €5.99 per month after that by clicking here. Customers who use laptops and PCs remain unaffected and will continue to be able to watch a limited number of channels for free. At Aertv, we are constantly trying to do more. More live streams, more sports, and more channels available on more devices. In order for us to continue to expand and to invest in a better service for you, we have taken the decision to charge a small fee for mobile access. In turn, we are reducing the amount of advertising, offering more channels and offering those channels in higher definition so that you can watch them on your TV as well as your laptop, PC or mobile device. We hope that you support us with our new mobile pay structure – it’s just €5.99 per month for 26 channels on Aertv Plus. If you don’t feel you can pay this then don’t worry – all the Saorview channels, SportsLive and live events are still free on your laptop and PC. The Aertv community has been very loyal and to reward that loyalty and take some of the sting out of our changes, we want to give you the chance to WIN €3,000 cash. We will be launching the competition in early January. We are offering a big cash competition worth €3,000 as our way of saying thank you for supporting us over the last two years. What if you are an Aertv Plus or Platinum subscriber? This change does not affect you. Aertv will still be available on mobile devices as part of your package. This change will allow us to innovate faster (launch android and smart TV apps) and provide you an even better service and more channels coming soon! If you’ve enjoyed Aertv over the last two years, we hope you upgrade to Aertv Plus and enter the competition for your chance to WIN €3,000 Cash. As always, we welcome your comments and are committed to making Aertv great for you. During this time we have also developed Apps for iPhone/iPad/iPod and instituted streaming to adapt to all devices no matter what kind of broadband connection you are on. Finally, we recently introduced Aertv SportsLive, an innovative platform which will enable any size organization to access its audience anywhere in the world. All of this has been done without any charge to the public. Indeed, it’s still free but like Spotify we need to charge for some of our services going forward. We have debated and thought carefully about this. The reality is that the cost of supporting free TV on mobile devices simply is not sustainable in the long run. We hope you continue to enjoy Aertv and that you help us to make it the best TV service in Ireland.